BUILT BY MESSRS ‘REDROW’ AS PART OF THE ORIGINAL ‘HERITAGE’ COLLECTION: A beautifully appointed detached family home. Through Entrance Hallway, Lounge, Open Plan Kitchen Diner, Utility Room, Cloakroom/WC, 4 Bedrooms, En-Suite Shower Room/WC, Double Width Driveway, Integral Garage, Enclosed Landscaped Rear Garden, EPC Rating: B.
Leegomery is a residential area located on the north western outskirts of Telford and to the north east of Wellington which offers a wide range of facilities and has good transportation links including its own railway station, leisure centre and its renowned four day a week market. Telford town centre is also accessible some 5 miles to the south with its wide range of recreational and shopping facilities, including the New Southwater development, the M54 motorway and the town’s central railway station. Miller Meadow is situated on the outskirts of Leegomery on a recently built ‘Redrow’ development. An open canopy and front door leads to the through entrance hallway which has a staircase ascending to the first floor, access to lounge and kitchen diner. The lounge has a bay window with outlook towards the front. The open plan kitchen diner has a range of base and wall units with under lighting, integrated oven and grill, integrated fridge freezer and dishwasher, useful under stairs store cupboard in the dining area and patio doors enjoying views and access to the rear garden. A door leads to the utility room where there are matching base units, space for washing machine, door to cloakroom/wc and external door leading to the rear garden. 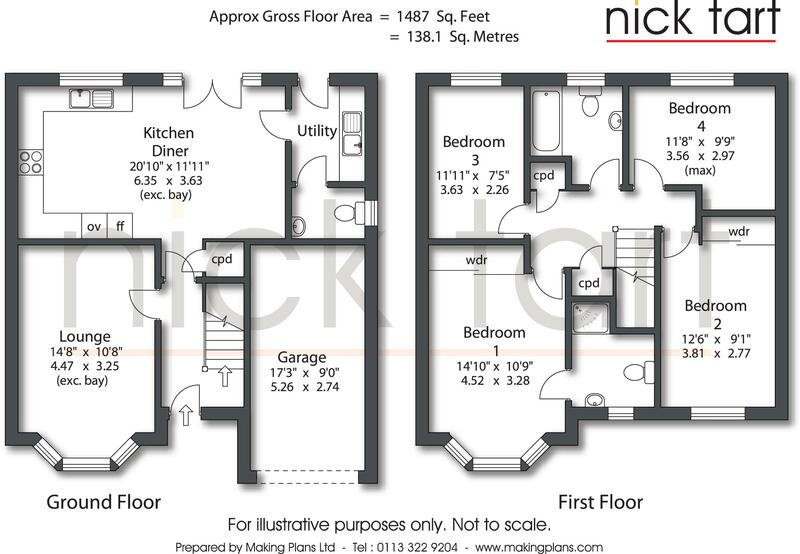 On the first floor there is a landing with access to four bedrooms. The master bedroom and guest bedroom have fitted wardrobes with the master having the benefit of an en-suite shower room/wc. The family bathroom/wc has a white suite comprising the usual facilities with the benefit of having a shower over the bath. The enclosed rear garden has a slate style patio and footpaths, two artificial lawn areas, shrub borders and gated access leading to the front where there is a double width driveway providing off road parking and giving access to the integral garage with artificial lawn area to one side. Council Tax – Band E (Buyers should be aware that improvements carried out by the seller may affect the property’s council tax banding following a sale).